Our runs meet at different locations each week so that we get to run on different trails and places. Full details of the upcoming run is posted on our facebook group on the pinned post. For security reasons we don't make locations publicly available on the Internet. How far and fast do we run? Generally groups run according to the group pace and regroup so we don't leave anyone behind. Quite often runners may want to run a longer distance but at a different pace. Speak to the leaders about a top-up. Each group is lead by one or more of our UK Athletics qualified leaders and coaches. What do I need to run with you? We require that you fill in a membership form if you like running with us and want to join more regularly. During the Winter months we continue to run trails at night time so a head torch is required. We normally have a couple of spare torches to loan out if you aren't sure if you'll like it ( we think you will ). During muddy/wet days trail shoes are recommended. When a run is announced on facebook we indicate what is required e.g. head torch, trail shoes etc. Ensure you have adequate running clothing to deal with changing weather throughout the seasons. If you are unsure at all, please contact us or post up on our facebook group. You'll get very helpful responses. Groups are lead by UK Athletics qualified leaders and coaches. Most are also first aid qualified. Leaders and coaches are DBS checked and insured as part of their licence. A typical group run begins with a briefing by the run director. Groups and paces are identified. A warm up preceeds the run and the group leader will cover any specific information about the route. A cool down stretch off is offered at the end of the run. Share chat with other runners! 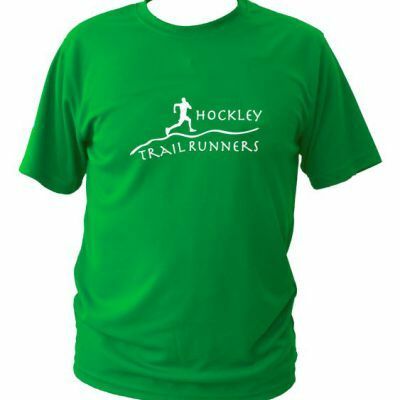 We have club t-shirts available from our online shop. There are also hoodies, zoodies, various styles of t-shirt for winter and summer. All available in mens, ladies and junior fit. To help you get to know others, there is the option to have your name or initials on free of charge. Can my child run with you? Children are allowed to run and are insured from 12 years old. The registration form would need to be signed by the parent. We also ask that the child runs with their parent.